Blood Line - Buy Product on Hospital & Homecare Imp. & Exp. Co., Ltd.
All tubes are made from medical grade,and all components are manufactured in original. 1. Pump Tube:With high elasticity and medical grade PVC ,the shape of tube remains the same after continuous pressing of 10 hours. 2. Drip Chamber:several sizes of drip chamber available. 3. 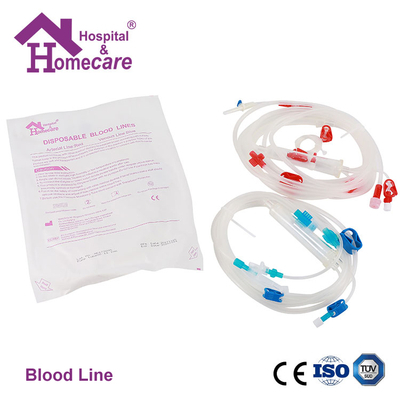 Dialysis Connector:Extra large designed dialyzer connector is easy to operate. 4. Clamp:Clamp is made of hard poastic and designed larger and thicker to guarantee sufficient stop. 5. Infusion Set:It is convenient to install and uninstall ,which ensure precision infusion and safe priming. 6. Drainage Bag:closed priming to meet the requirements of quality control,single way drainage bag and double way drainage bag available. 7. Customized Designed:Different sizes of pump tube and drip Chamber to meet the requirements of customers.